As many of you know, weekends are normally wide open in terms of visiting. Tomorrow, however, Kevin will be in rehab until 2:00 p.m., so we just wanted to let everyone who wants to start their New Year by hanging out with Kevin for a bit that he won’t be available until at least 2, so plan your visits accordingly! We hope you all have a safe and happy new year’s celebration, and we are again grateful for all of the support you’ve provided Kevin and our family. Nothing major to report on the rehab front. Today was a pretty standard day in rehab for Kevin. He had a lot of visitors tonight, which he always seems to enjoy. Thanks for everyone who came by! Many of you have asked about tomorrow’s hearing for the person who is charged with attacking Kevin. Tomorrow’s hearing is a formal arraignment. Since this is one of over 200 cases being heard tomorrow (according to the schedule), we are not sure when exactly the hearing will take place. This portion should go pretty quickly and is a formal reading of the charges against him. For that reason, we do not think it’s necessary for folks to attend tomorrow. The district attorney will let us know if there’s a hearing that family and friends should attend. We’ll be sure to update the website so that those interested in attending relevant hearings in the future will be aware. Thank you to the 40-plus people who have bought tickets for the Barnaby’s event on February 4th. Buying tickets in advance really helps us plan. We’ll have more details about the event as those come together. Thank you again to those who have volunteered auction items and other ways to help. Please email nearyjp@gmail.com if you’d like to help further. Please note that additional events are in the works, and we’ll be sure to post info about helping out with the trust we’re setting up for Kevin in the near future if you aren’t able to help with the Barnaby’s event. Thank you all again for your continued support of Kevin and our family. Before we get to the longer update, a quick note on visiting, especially if you’re coming in tonight. There are certain nights when Kevin finishes therapy later, and then needs a bit more time before he can see visitors. Tonight is one of those nights. You can still come in earlier, but just know that you may not be able to see him until 6:00 p.m. or so. Thanks for understanding. In physical therapy, Kevin has been doing a lot of education so he’s aware of the complications he may face, how to direct his care, and how to instruct others on the best way to meet his needs. In occupational therapy, Kevin will start focusing on self-care skills, how to direct others to help him with those. This week they’ll start testing out different types of power wheelchairs, assessing how he’s able to function with them to make sure Kevin gets the best fit moving forward. They’ll continue to move forward with different assistive technologies so that Kevin can practice and get better using them. His stay at Magee will probably be seven more weeks. That’s a little bit longer than we initially anticipated, but it gives him more time for therapy. Kevin also saw his orthopedic surgeon at Jefferson His neck is stable, but will need to be in a collar for the next two weeks. At that time, Kevin will be able to do more range of motion therapy on his neck. In terms of Kevin’s voice, his speech pathologist and respiratory therapist are training him how to speak in rhythm with the ventilator. Right now, Kevin’s doctors believe he will be ventilator-dependent long-term, so this therapy will be really important going forward. At times, working with the respiratory therapist, Kevin has been able to vocalize for short periods of time. First, if you’re interested in attending the event at Barnaby’s on the 4th, we are setting up a website where you can buy tickets. That should be available soon. 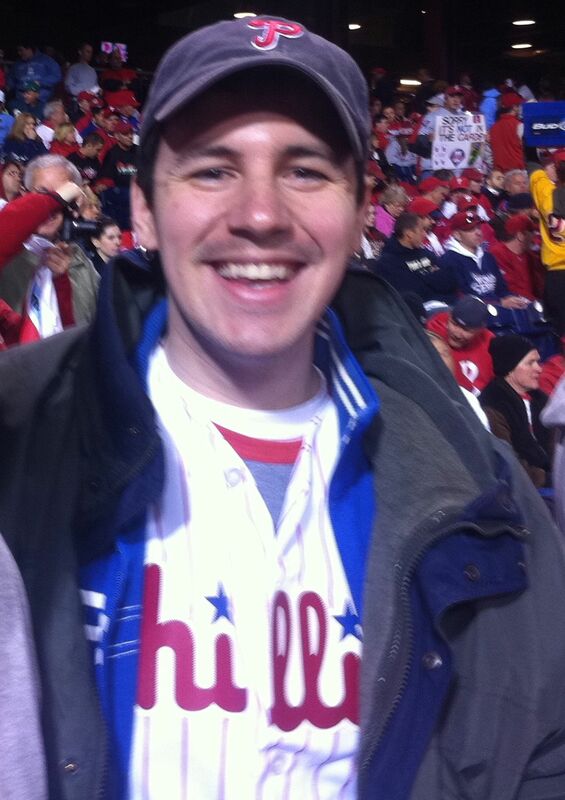 We met with Kevin’s attorneys on Thursday, so we hope to have the fund for Kevin set up within the next week or so. At that point, it will be easier for us to start up different mechanisms to support Kevin. We appreciate your patience and continued interest in helping Kevin and our family. Over the next week or so, we’ll also have a better sense of the modifications we’ll need to do to the house and the type of van we’ll need to get. That’ll be a big event, so we’ll keep you posted on that too. It is hard to believe that we are approaching the 2 week mark at Magee. Kevin has been doing some really interesting things in therapy. As some of you saw Kevin made a facebook post yesterday. With the help of his therapist, Kevin has been learning how to use a computer with his eyes. We are hopeful that this will become much easier when he can use both his eyes and voice to control a computer. The other critical part of the therapy process is helping Kevin to help us direct his care. A large part of Kevin’s progress is him learning how to tell others what things he needs, what needs particular attention and how to best help him. Its not easy learning how to live a completely different life but he is learning quickly. This week will be pretty eventful. It sounds like Kevin will take a quick trip over to Jefferson on Thursday morning for an evaluation with the orthopedic surgeon who did the spine stabilization procedure. We are hopeful everything will check out and he will be one step closer to living with out the neck collar. Thursday afternoon is our first family meeting with his team of doctors, nurses, therapists and other caregivers. This meeting should give us a good road map into the next two weeks of therapy, establish some goals for Kevin and answer a good number of questions we all have. Again, thank you all for your ongoing support. An increasing number of you have asked how to make contributions for Kevin’s short and long term needs. We can not thank you enough. We have an attorney working on setting up the best possible trust for Kevin that will provide for his needs. As soon as we have this established we will let everyone know. We just want to make sure we take the correct steps so that Kevin is not at a disadvantage. Thank you all for your patience as this is established. We will do another update tomorrow evening after our family meeting. After 9 full days at Magee we are starting to really get into a routine. Each day brings a new challenge and an opportunity to learn something new. We have so much to learn to really prepare for Kevin’s long term care but the instruction has been great. The newest change in Kevin’s daily routine is that he is able to each small amounts pureed food. After an evaluation but the speech therapist, Kevin is starting to adjust to eating real food. He will remain receiving nutrition through his feeding tube but this is a great step forward. Kevin’s friends at North Bowl are also hosting an event for him. The date is Sunday, January 29th at 4 pm. There will be a bowling tournament with teams of 5, $50 per person. If you would like to participate in the tournament, contact leagues@northbowlphilly.com , Subject line “Kevin Neary Fundraiser”. Please RSVP in advance so we know how many teams there are and have time to set up the tournament. Many have asked about getting one of these bands. We just ordered an additional 1,000 available in red and blue. We will have a few in Kevin’s room and certainly on hand at the benefit. If there is anyone long distance interested, please send me an email and I’ll do my best to get them to you. It might take a little time to respond to each email but please know it will be read. I’ll try to get another on of these up tomorrow or Monday. Thank you all for yor continued support! It is hard to believe that one month has passed since Kevin’s fight got started. After 5 days in intensive care at Hahnemann, 20 more at Jefferson and now 6 at Magee, it is hard to imagine the long road ahead. But each step down the path is one closer to Kevin living his life to the fullest. Not too much has changed since our last update. The staff at Magee has been tremendous helping us all adjust in the first few days. We have a meeting next Thursday with Kevin’s full team of doctors, nurses and other staff to help evaluate and plan for his next steps. As these meetings happen throughout the rehab process we will keep you posted. Each meeting will bring a clearer picture of Kevin’s short term needs and long term outlook. Many of you have asked how to help, where to send donations and the like. I don’t have an answer just yet but we are working with an attorney to make sure we set up an entity that will provide Kevin what he will need long term. We will also have a better sense of what some of his short and long term needs will be when we have more information from our team meeting at Magee and some feedback from different State resources. 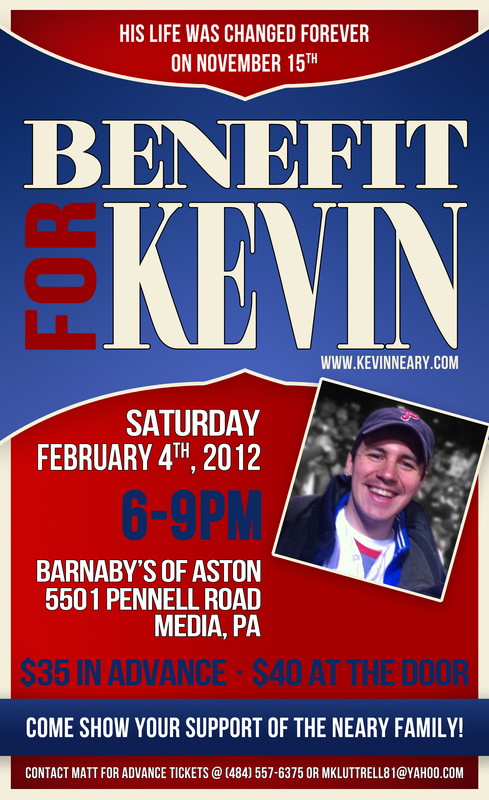 I’m sure many of you have seen the benefit for Kevin, the first of several, that will be held on February 4th from 6 – 9. Matt Luttrell has been pulling all of this together. If you are interested in helping out please shoot him and email at mkluttrell81@yahoo.com. A special thank you to Jess Ewing for designing the poster! There are a handful of other events that people have offered to host. As these take shape we will post the information right here. Thank you to everyone helping with these events! Again, thank you all for reading this website, praying for Kevin and our family, stopping in to see him and all the other little things, too numerous to mention, that you all have done. Stay tuned for another update Thursday or Friday. Sunday was Kevin’s third day at Magee. Friday was filled with a decent amount of paperwork and getting settled. Saturday and Sunday were mainly his first few hours of rehab and fighting off a pretty high fever. The doctors and nurses will do a few blood tests on Monday to make sure the fever he had is not some sort of infection. Once Kevin starts his first full week we should have a better sense of his daily therapy schedule. As the details of his daily routine become available we will certainly share them with you all. For the moment anytime after 5:00 should be clear to visit as most of the PT and OT sessions are complete by that time. Magee is set up a bit differently for visitors. They require each visitor to sign in and carry a room number badge at all times. They currently allow 5 visitors per patient, so if you get to the hospital and all the passes are taken there are a few seats in the lobby where you can wait for another visitor to leave. If you find you are waiting for a while please call my dad or I and one of us will come down. We are assuming Kevin will be at Magee for the next 8 weeks. His progress will be evaluated on Thursdays by his whole team of doctors, nurses, therapists and case managers and as time goes on we will have a better sense of his next steps. We will post their suggested visiting hours as soon as Kevin gets settled. We anticipate that he will be keeping a busy schedule of rehab, which is good. But we don’t know exactly when it would make sense for people to visit. We will let you know ASAP. Today is also the preliminary hearing for Christopher Easter is this morning. Joe (JP) will be attending. We’ll let you know how that goes. That’s all for now — big day, but a brief update. We hope to have an update later tonight to let you know how it all went. It has been a tough couple of days for Kevin, both physically and emotionally. Kevin underwent a procedure to put in place a permanent pacemaker, which will help ensure he doesn’t have any heart issues at the rehab facility. The pacemaker is now in place and he is recovering from that procedure. Unfortunately, however, Kevin’s left lung collapsed during the procedure, so the doctors had to put a temporary tube in his lung to re-inflate it. It’s not the best news, but the situation is being managed. Kevin also ran up against a blocked feeding tube. After some work and some X-rays it seems that the doctors have been able to get that up and running again. The last few days have also been tough because Kevin has had to grapple with the news that his injury may be worse than initially suspected. There are some indications that the bullet and its percussive effect may have done damage further up the spine, which means Kevin may have less control than we anticipated. Much of this is still unknown and will take a full evaluation with the people at the rehab hospital to have a better sense of what the future holds. We don’t have to tell you that Kevin is a fighter, and we are sure his willpower and hard work will have a huge impact on any outcome the doctors expect. Once we have a clearer picture from the rehab specialists we will certainly share it with all of you. We are expecting that Kevin will move to rehab in the next few days. Dad, Kathy and JP are headed over to Magee Rehabilitation tomorrow to see the facility and get more information. Please stay tuned for updated room and visitor information.